JOE Kernan’s Irish team came a long way to taste bitter defeat, coming out on the wrong side of the latest International Rules series. Ireland lost the series 2-0 and by a margin of 116-103. However, a late tackle by Joel Selwood and some cheap shots by the hosts would cause tempers to boil over and become the talking points of the series. However Tadhg Kennelly, who played AFL for Sydney Swans and represented Ireland in International Rules, said the series was the best yet. “I think it was probably the best series ever played to tell you the truth,” Kennelly told the Irish Echo. “I’ve been involved in six series as a player, four series as a coach. As far as a competitive game and spectacle and the quality of the game itself and the way it was played by both teams, I think it was the best one. “You need the best players from both codes to be playing. There were some missing from both but not a huge amount really. I think the concept has grown a lot of legs after that series.” Asked if the Dublin footballers were missed from the spectacle, Tadhg says: “Yes and no, it’s a bit difficult. People have got to understand they have been on the road for three years in a row really and right up until the end of September, it can take its toll on you. “A lot of them played in the past also, it must be said. “It is not as if they haven’t played and represented their country. It just happened that the majority of them have been still involved in their club football. “It’s very difficult being a county footballer when you’re being pulled and dragged, something has to give. It’s just a coincidence and the players have said that. (James) McCarthy said, we wanted to play, we have played in the past but it has all happened at once. “If you look at the Australian team though, they had no representation from the Richmond team that won the flag.” Michael Murphy and Conor McManus starred for Ireland and the Irish would have struggled to even keep in touch without their scores. 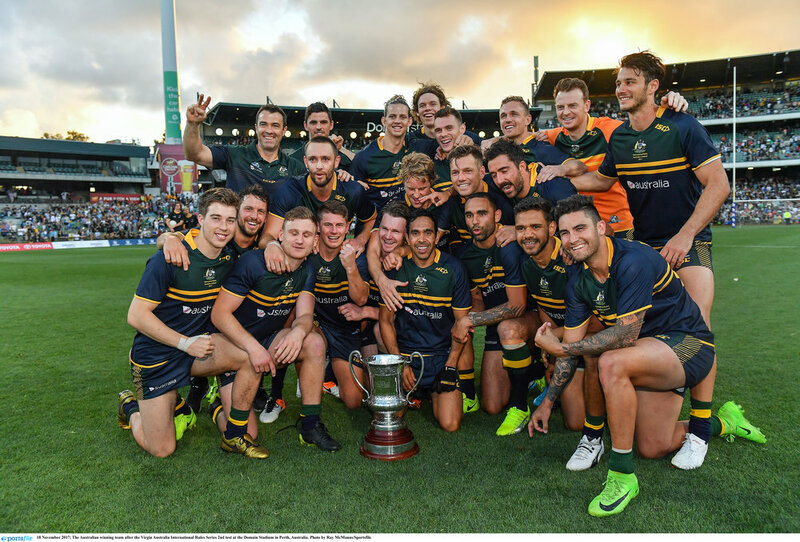 The Australian International Rules squad celebrate their success with the Cormac McAnallen Trophy in Perth. The first test at Adelaide saw Ireland starting well, leading 15-14 after the first 20 minutes. Their lead was stretched to 10 in the second quarter when Michael Murphy scored the first goal of the game. Michael Murphy and Conor McManus were Ireland’s best forwards, taking the lion’s share of the Irish scores. Pearce Hanley of the Gold Coast suffered a hand injury, ending his series and further depleting the Irish squad. Australia’s devastating pairing of Ben Brown and Nat Fyfe made sure they went in at the half-time hooter one point to the good, 28-27. The heat took its toll on the Irish, who wilted in the second half, losing the third quarter 22-8 but they would do well to fight back, taking the final quarter 18-13, making it 63-53 in favour of the home team going into the second Test. Ireland threatened to comeback in the second test in Perth with early Gary Brennan and Chris Barrett goals putting them in a commanding position, but Australia would produce a strong finish to claim the Cormac McAnallen trophy. Ireland led 30-17 at the break when a black card for Joel Selwood saw tempers boil over and a melee erupted after the foul on Chris Barrett. Conor McManus kept Ireland in it with his fine shooting but Australia took an overall lead of seven points going into the final quarter and would finish stronger to take the match 53-50 and the series. On the Selwood tackle that caused so much controversy, Kennelly said: “It’s just a different understanding. I think it’s certainly a free-kick, penalty and that’s in any of the two codes but players when they handpass in AFL, they brace themselves for the contact coming whereas in Gaelic football, we don’t do that as much. “I can obviously see the uproar from Ireland but I just think there’s a grey area that’s always going to be there because of the interpretation of rules from countries that are so far away and concepts of the game are very different.